Kate Beckinsale marked her 45th year surrounded by goats and her ex. The Love & Friendship star celebrated her birthday on Thursday, yet added an extra day of festivities on Friday when she tried yoga with goats alongside her daughter Lily and ex Michael Sheen. When I arrived at goat yoga class Wednesday night, I had two things on my mind. First, I don’t do yoga. Second, I don’t generally hang out with goats. I asked myself that as I saw one of the goats, Burlap, eating a hedge while the other, Billy, rammed a bench with his horns. I’m in the midst of an hourlong yoga class at Laughing Frog Yoga in Santa Monica, during which a pair of 15-pound white baby Nigerian Dwarf goats named “Lil’bit” and “Fanny Farm Girl” — whose black spots, tiny horns and floppy ears more closely resemble stuffed animals than livestock — are headbutting, nuzzling and leaping on us while we attempt to hold a series of poses. Goats were an unlikely choice for the class considering their lack of language skills, which makes abiding by the “Yes, and…” mandate—the first and maybe only rule of improv—incredibly difficult. Los Angeles Times - In goat yoga, the point isn't to sweat. It's to have a baby goat climb on your shoulders during your plank. File this under workouts you can’t believe are an actual thing. 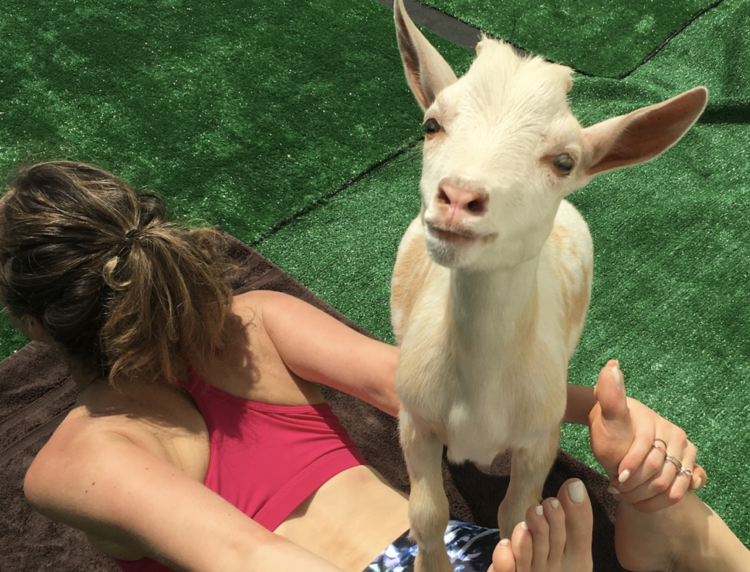 Goat yoga, which is yoga practiced in the presence of — and in tandem with — live goats, is the latest exercise to capture the imaginations and Instagram feeds of Angelenos. Some believe goats belong in a barnyard, not a yoga studio. 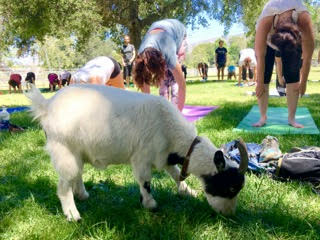 But those people were noticeably absent Saturday, when the Community Center of La Cañada Flintridge hosted a first-ever goat yoga class for both the curious and the convinced. As the only place in the U.S. where you can get a Master's Degree in yoga, Los Angeles is flooded with yoga options: Hot yoga, baby yoga, disco yoga, 420 yoga, or astral projection yoga. None of these can contend with the latest yogi trend of goat yoga, hosted by the animal lovers at Hello Critter Care. If you haven’t reached into bakasana alongside a baby goat named Spanky, you have not yet ascended. You read right, Goat Yoga is a thing and it’s a glorious thing at that. The good people at Hello Critter Goat Yoga (aka Michelle Tritten) host a variety of classes for beginners and enthusiasts alike. All with a crew of adorable goats who love to join you in your positions. It may sound strange but their amicable presence helps you abandon all insecurity and focus on holding your pose so that you can be a suitable perch for Billy, Burlap, Roscoe, and Floyd. On a gray and chilly Saturday morning in Glendale, around 75 people gathered for a yoga session at Griffith Park's Bette Davis Park Picnic Area. But the real guests of honor were of the four-legged variety: a miniature horse and four pygmy goats brought out by Party Goats LA and Hello Critter Care. Michelle Tritten, the founder of Hello Critter, has kept pet goats since the 1980s and practiced yoga since the 1990s. The Glendale-based company hosts goat yoga classes with Nigerian Dwarf goats at locations throughout L.A, including Golden Road Brewery. The combination of goats, yoga and beer attracts enough participants to sell out each month. 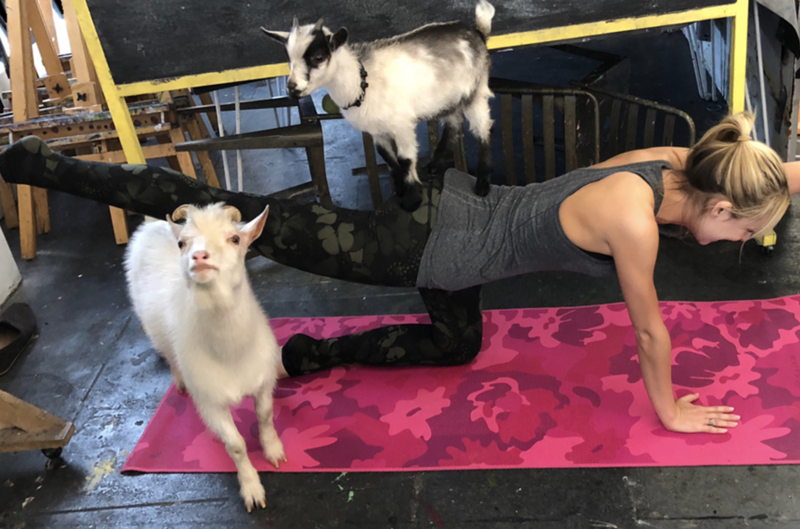 Amanda Deak - Goat Yoga Is A Thing! Some of you may have already heard about goat yoga, but for those of you who haven't.. yes it is legit! Overall, I highly recommend doing Goat Yoga. It was a fun and relaxing experience. 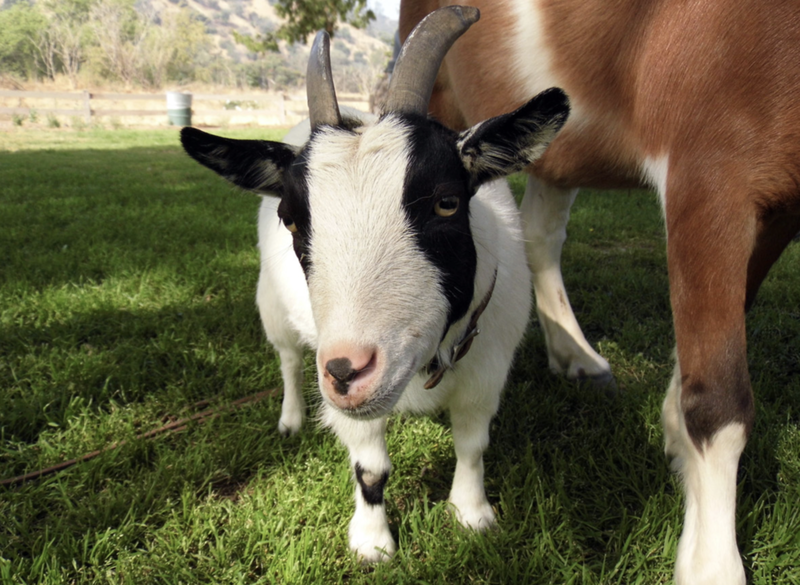 The goats serve as therapy pets and help you relax and smile. Also, doing yoga outdoors was very peaceful and really added to the experience and atmosphere. Laughing Frog Yoga offers “Goat Yoga” classes at their indoor studio in Santa Monica. They have partnered with Michelle Tritten of Hello Critter Care and her two goats, Roscoe and Floyd, to bring joy to yogis everywhere. It’s so funny and weird, but you full blown lose yourself in the experience, especially because alcohol is involved. This one was at a brewery lmao. And the goats straight up walk all over you like it’s no big deal. The pastoral pastime, which winningly combines mild exercise with adorable baby animals, has been reported mostly in small farm towns across America, from Virginia and New Hampshire to Oregon and Colorado. But the goat yoga session being held last weekend, in a stretch of park so tranquil you’d forget it was straddled by the 5 and 134 freeway interchange if it weren’t for the hum of nearby traffic, appears to be the first of its kind in Los Angeles. Shocking Times - Hollywood Stars Love Doing Goat Yoga! In this lighthearted class, 15-pound Nigerian Dwarf goats roam the premises, hop on peoples’ backs and weave under those engaging in downward dogs. Instructor Jocelyn Yamasaki says that students are able to stretch and strengthen their bodies, refresh their minds and pet baby goats all in one place. 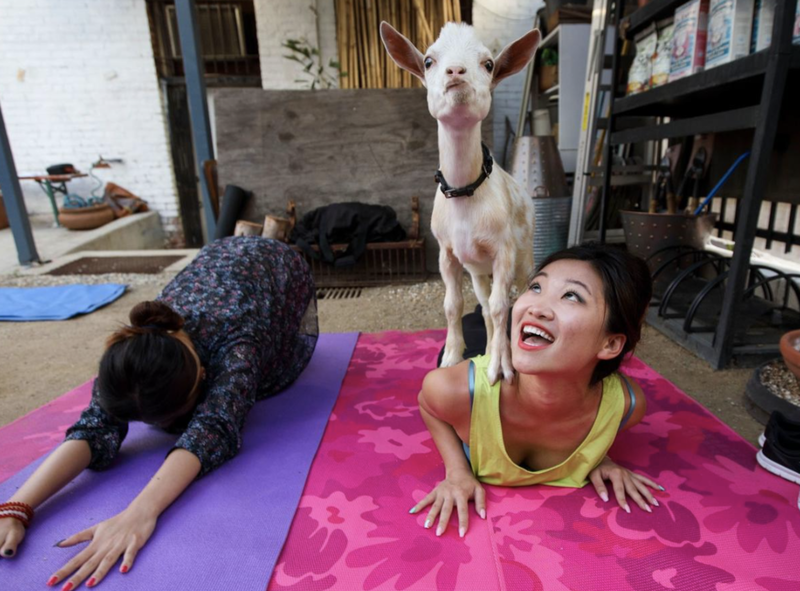 Not surprisingly, the goat yoga movement in L.A. has a distinctly showbiz angle to it. 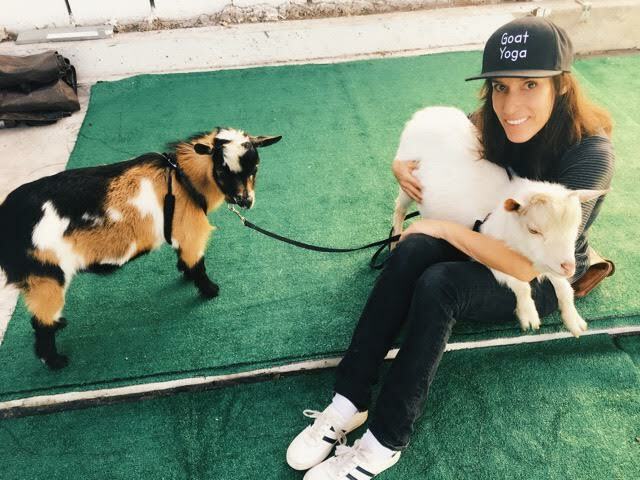 It arose out of Hire Our Party Goats, which — with former child actor Scout (née Jessica) Raskin at the helm — hires out its goats for film shoots, birthday parties and other events. Her two Nigerian Dwarfs have been trained well to respond to treats — so it was a natural evolution to partner with the Hello Critter Care pet service and place those treats strategically on the not-so-unsuspecting backs of yogis and yoginis. When I first saw a video of people do- ing yoga with goats on my Facebook feed, I was hooked. And while I was a little nervous to *actually* do it (would it hurt? would it be smelly? ), I signed up for a class at Hello Critter Goat Yoga in Glendale, Calif. The thing we’re known most for, is Goat Yoga. We’re proud to be doing something that brings people together, releases stress in difficult times, creates tolerance, joy and happiness thru interaction with these playful, fun-loving creatures. We are also happy to be helping goats find forever homes. We are not the only goat yoga gig in town, but we’d like to be known for having goats that do good. We enjoy participating in fundraisers to help those less fortunate than ourselves. My writing had gotten stale. I needed a creative boost. I’d taken workshops over the years, but I always had the nagging feeling that they lacked something. What could it be? A celebrity instructor? Genius students? A tropical location? No. As it turned out, the thing that was missing from my classes was baby Nigerian dwarf goats.